In Swahili, Kidogo Kidogo means “little by little.” And little by little, the cell phone case company Kidogo Kidogo is improving the lives of Tanzanian women. By helping lift the financial barrier that prevents women in Tanzania from having access to mobile technology, Kidogo Kidogo offers stylish cell phone cases with a purpose. Currently, only 36 percent of women in Tanzania own mobile phones, and the number one reason preventing them from ownership is the initial cost of a mobile handset. Mobile phones in Tanzania are prepaid; owners can buy credits at bodegas and other small stores around the county. 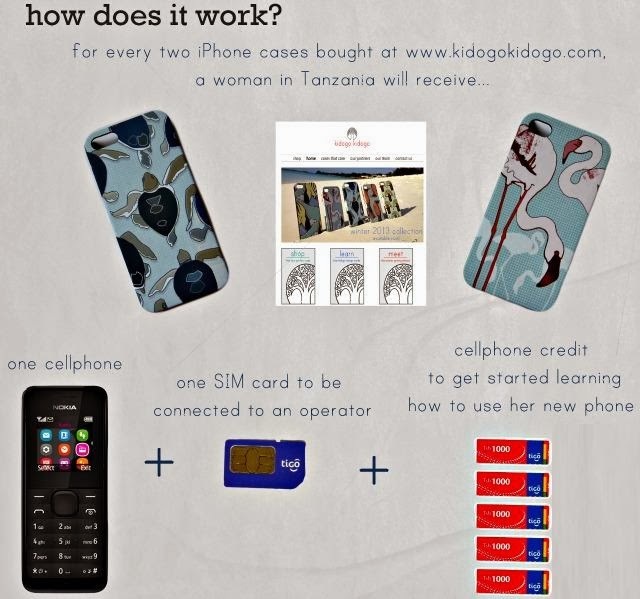 For every iPhone case purchased from Kidogo Kidogo, a mobile phone or mobile phone credits are donated to a woman in Tanzania. To these women, a cell phone is a life-changing tool; a flashlight, a watch, a calculator, a camera, a doctor, a teacher, a radio. In Tanzania, mobile banking is extremely common, and a phone provides women a way to make secure banking transactions. Mobile phones are also used monitor consumer markets and are a way for expectant mothers to receive health reminders and updates. Women with mobile phones also report a much higher feeling of personal safety than those without. The phones are distributed to women through established non-profit partners already working in Tanzania. One of the partners is FINCA, a global charitable microfinance organization, whose mission is to provide financial services to the world’s lowest-income entrepreneurs so they can create jobs, build assets, and improve their standard of living. Kidogo Kidogo has also also partnered with Sea Sense, an environmental NGO in Tanzania. A portion of the proceeds from the sales of the sea turtle case goes to Sea Sense, who works closely with coastal communities in Tanzania to conserve and protect endangered marine species. This is not a new concept, many of us are already sporting a pair of TOMS shoes or Warby Parker frames. But it’s great to see such a charitable concept extend to other accessories and fashion items. Kidogo Kidogo was kind enough to send me two cases to try out; I have had the sea turtles one on my phone since it arrived in the mail and Karl snagged the flamingo one for himself. Not only are the covers gorgeous thanks to the work of Tanzanian-based artist Sarah Markes, they are well made, sturdy, and have a non-slip finish. Kidogo Kidogo cases are $30 each and currently available for the iPhone 4 and 4s, iPhone 5 and 5s. Check out the designs and more information about Kidogo Kidogo on their site, the Kidogo Kidogo Facebook page, and consider following them on Twitter and Instagram. I started this series last year and planned to have the posts on Sunday, but to make it better align with the national Small Business Saturday event I’m changing this series to Saturday. This series features small businesses in the United States that focus on style with substance. Stay tuned to learn about more great small businesses! I love this! Always so great when companies make beautiful things AND help their communities/countries/the world! Going to check them out now and definitely going to share your post.